This is a forum for previous years presentation, on-going banjo research projects, upcoming events, and news. 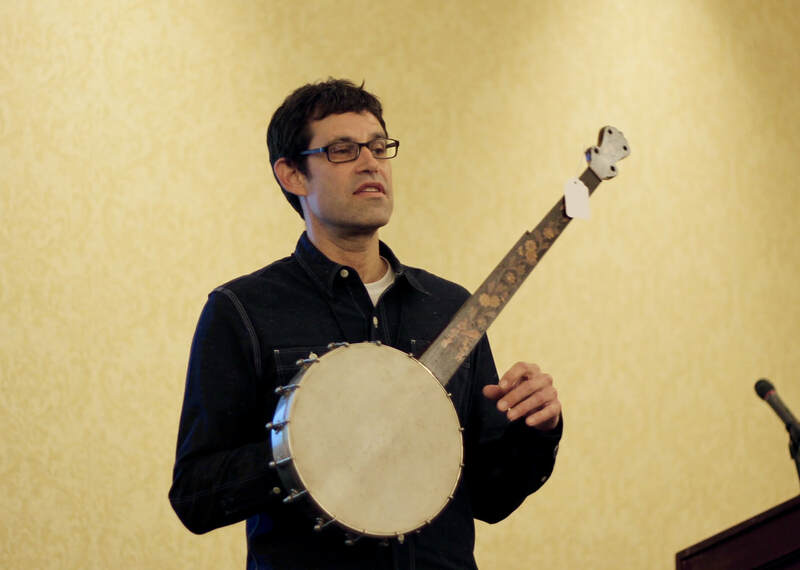 Read more from first-time attendee Louis Linden and his thoughts on the Banjo Gathering, featured in a recent issue of Banjo Newsletter. 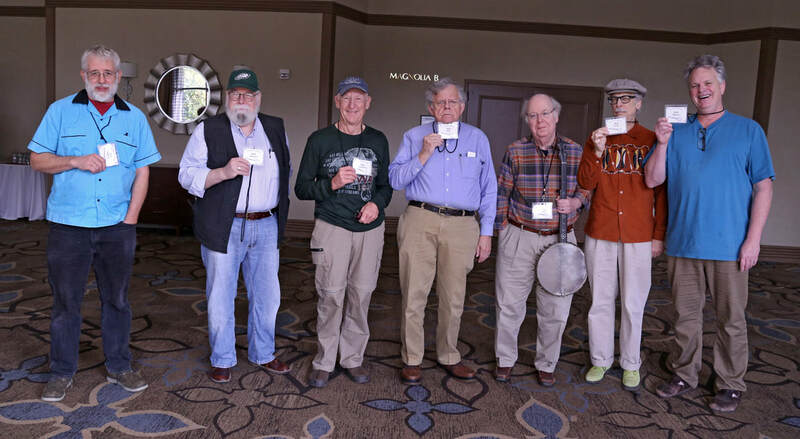 Read attendee Clifton Hicks' brief overview of the 20th Anniversary Banjo Gathering on Sing Out! For those who missed the 20th Anniversary Banjo Gathering in Bristol, Virginia/ Tennessee, we are happy to share the concert courtesy of Radio Bristol here on our blog. Enjoy! Support The Banjo Project on Kickstarter and be part of the first digital banjo museum! From the project website: "Since 2002, The Banjo Project has produced and collected over 300 hours of original video, with interviews and performances by banjoists in all styles: Pete Seeger, Earl Scruggs, Bela Fleck, Rhiannon Giddens, Mike Seeger, Taj Mahal, Sonny Osborne, Cynthia Sayers, Don Vappie and many others, as well as expert commentary from banjo builders, historians and researchers. Meanwhile, over the past decade, there has been a quiet explosion of cultural history research, critical reappraisal, and musical reinvention, including producer Marc Fields’ PBS documentary Give Me the Banjo (narrated by Steve Martin, national broadcast 2011)." "Marc knew from the start that the banjo’s long and contested history could not be fully represented in a standalone TV documentary. The challenge: how to leverage the new media technologies, our archive of original media and the wealth of recent scholarship to provide cultural context for the instrument, its diverse music and players, and make it accessible to the widest possible audience? We spent the past seven years developing other media platforms, finally arriving at an innovative online media platform we’re calling a digital museum." Read more about The Banjo Project and support the museum today! In 2016, Brooks Masten presented about his history as a banjo builder and his influences and personal style. If you missed it, he was recently interviewed on the Get Up in the Cool Old Time Music podcast and tells his story with some great tunes tucked in between. Click here to listen to the full interview on the Get Up in the Cool podcast. Check out Brooks's website for more info on his banjos. Long time attendee and banjo maker Pete Ross was interviewed with Kristina Gaddy on the Hey Baltimore podcast about the early history of the banjo and the instrument's connections to Baltimore, Maryland. The knowledge and research that are behind this podcast are a result of the last 20 years of the Banjo Gathering. Much of the research into the West African connections to the banjo have been done by participants Ulf Jagfors, Schlomo Pestcoe, and Bob Carlin. 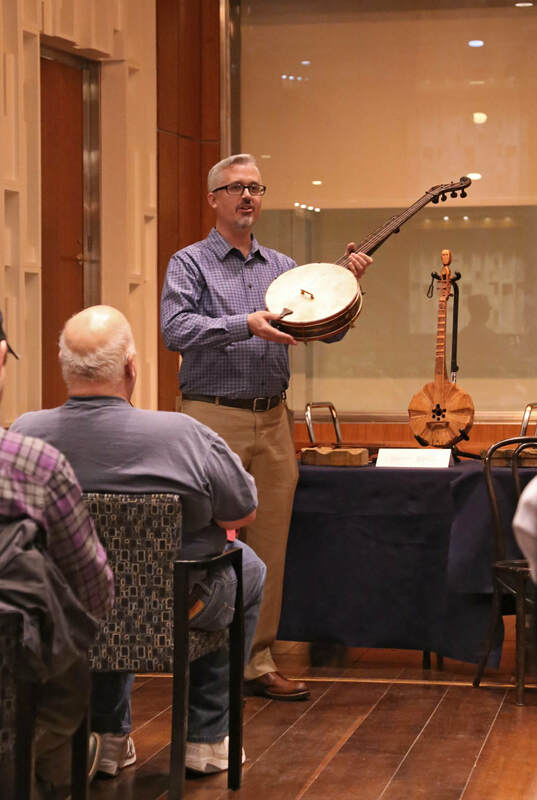 Pete Ross, Bob Winans, and Greg Adams did an extensive presentation about banjo maker William E. Boucher, which transformed into an exhibit at the Baltimore Museum of Industry. And in recent years, Pete and Kristina have presented on Baltimore banjo maker Levi Brown and early American banjos. ​The life and music of renowned Appalachian-style fiddler & folklorist Alan Jabbour (1942-2017) will be celebrated at the Library Congress on Thursday, January 18, 2018 from 6:00 PM to 9:30 PM. The event features a reception (with food and drink), brief presentations on Alan’s accomplishments and legacy by Carl Fleishhauer, Stephen Wade, and Ken Perlman, and a jam session (led by Ken) devoted to the well-known old-time tunes that Alan collected from Henry Reed and other Appalachian fiddlers. At the 2017 Banjo Gathering, CW Bayer presented the wild history of banjos out west. His book The Strychnine Banjo, follows the accounts of Charlet Roades and Jake Wallace's exploits from the 1850s to about 1910. Below is an except, describing Jake Wallace playing banjo to accompany Lotta Crabtree in Virginia City in 1863. ​During 1862 and early 1863, Jake Wallace played with some of the major San Francisco minstrels stars at McGuire’s Opera House and the Eureka Music Hall. During the summer of 1863, in Virginia City at the Virginia Melodeon on C Street, he accompanied Lotta Crabtree as she sang a Mart Taylor lyric, “Bound for the Land of Washoe:"
Stocks are up and stocks are down. And I’m bound for the land of Washoe. O! I think they are the largest and the best. The 20th Annual Banjo Gathering! 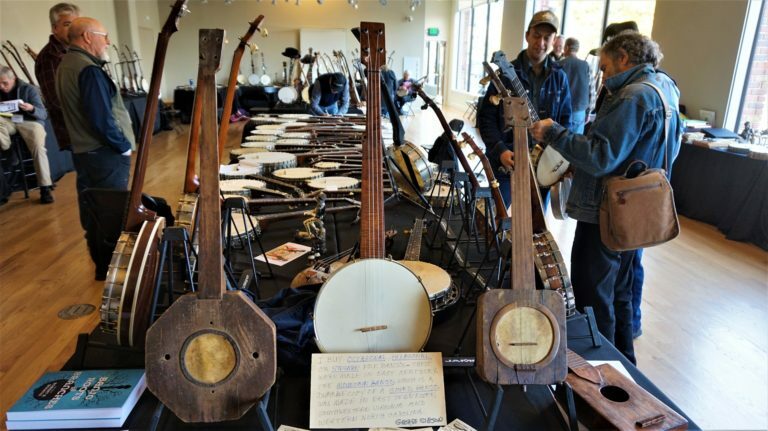 The 20th Annual Banjo Gathering was held in Alexandria, Virginia, from November 2nd-5th. Presentations ranged from the earliest history of the banjo to post-war Gretsch tenor banjos, and everything in between! We visited the Smithsonian National Museums of African American History and Culture and American History. For a complete look at the schedule, click here. If you are interested in taking our survey about the Gathering to help us plan for the 20th Anniversary Gathering next year, please click here. Special thanks to Greg Adams, Peter Szego, Kathryn Weidener, Jim Bollman, and Ann Hough for making this event a great success! Stay tuned to the blog for more sounds, sights, and stories from 20 years of the Banjo Gathering. Greg Adams with a Baltimore-made Boucher Banjo at the Smithsonian National Museum of American History. We are delighted to announce that two of our colleagues will be in the spotlight at the annual American Banjo Museum Banjo Fest at the American Banjo Museum, Oklahoma City, OK, September 7-9, 2017. Jim Bollman will be receiving the Jack Canine Award “for his lifelong dedication to the preservation of the banjo” at the Banjo Hall of Fame Induction Ceremony, and Bob Carlin will be performing Joel Sweeney tunes at the same ceremony, which will take place Friday, September 8. Bob will also be performing at the Banjo Fest on Saturday. Please go to http://www.banjofest2017.com for schedule and registration information. This is a forum for previous years' and on-going banjo research projects. If you are interested in submitting something for the blog, please use the "Contact" page!